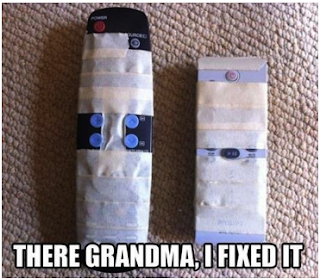 *Putting cellotape over switches I didn't want turned on or off. This worked - the transparent tape was too hard to find to rip off. *Chaining the cat food bowl to anything nearby so she couldn't keep moving it and putting it somewhere weird, like the cupboard or the fridge. But she was smart enough to go and get another dish and tip the cat food into it. *Locking kitchen cupboard doors with chains, but she just ripped the doors right off their hinges in her desperation to get in there - who knows why. *Having a doorstopper screwed into the floor near the bedroom door so she couldn't keep locking cats in there. *Having the back windows screwed shut so she couldn't open them in the middle of the night and go "Puss puss puss!" while trying to let cats in via the windows. *Turning off the water so she couldn't flood the place while I was gone, and only leaving enough water in the jug for her to drink. *Taping the mobile phone together to discourage her from pulling it apart and removing the battery. But she can remove tape. But really, nothing will prevent their extreme agitation and determination to do weird stuff. Thats exactly the stuff I do! Man are they button pushers! My mother pushes the buttons even with the tape and paper over them! She changes the language on the caller ID all the time. I shut off things in the fuse box & screwed it shut. Thanks you so much for sharing this. My grandmother has been forgetting so easily lately, I thought there was no way it couldn’t be Alzheimer’s. From your signs, I think it is. I hope we can get her some help soon.